There was a time when "universe" meant all there is. Everything. Yet, a number of theories are converging on the possibility that our universe may be but one among many parallel universes populating a vast multiverse. Here, Briane Greene, one of our foremost physicists and science writers, takes us on a breathtaking journey to a multiverse comprising an endless series of big bangs, a multiverse with duplicates of every one of us, a multiverse populated by vast sheets of spacetime, a multiverse in which all we consider real are holographic illusions, and even a multiverse made purely of math--and reveals the reality hidden within each. 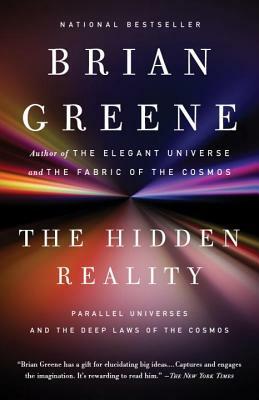 Using his trademark wit and precision, Greene presents a thrilling survey of cutting-edge physics and confronts the inevitable question: How can fundamental science progress if great swaths of reality lie beyond our reach? The Hidden Reality is a remarkable adventure through a world more vast and strange than anything we could have imagined. Brian Greene received his undergraduate degree from Harvard University and his doctorate from Oxford University, where he was a Rhodes Scholar. He joined the physics faculty of Cornell University in 1990, was appointed to a full professorship in 1995, and in 1996 joined Columbia University, where he is professor of physics and mathematics. He has lectured at both a general and a technical level in more than thirty countries, and on all seven continents, and is widely regarded for a number of groundbreaking discoveries in superstring theory. His first book, The Elegant Universe, was a national best seller and a finalist for the Pulitzer Prize. His most recent book, The Fabric of the Cosmos, was also a best seller. He lives in Andes, New York, and New York City.